Take Care Messages for Husband : As a married couple husband and wife get the responsibility to take care of each other. Taking care of each other makes the relationship stronger than ever. There are many ways to take care of someone special as the husband. Sending take care messages for husband is one of them. Admit it or not, wives are always one step ahead of caring for their sweet husband. Here are some sweet and romantic take care messaging ideas for husband. Read out these heartfelt take care messages to find the perfect message for him to share! Make your man realize how much you care for him and show that he is the true love of your life, the source of your smile and happiness! Do you have any idea that who are you? You are my heart, my loving husband! So it’s your duty to take care of my heart! My dear, Hubby, I know how much you care about me but don’t forget to take care of yours because you are my happiness! How are you? Don’t ask me again. Because it depends on you. You are the special one whose every single word can change my mind. Though we are staying far from each other we are connected by heart. Please take care of yourself! It’s midnight! Suddenly I wake up by viewing a dream of you. Are you ok? I hope you are taking good care of yourself. In every up and down, we were together. I wish we’ll together forever. I know You are always there to give me a comforting hand and keep it in your mind that I’ll also here caring for you forever. Take care! When you are so busy with your work don’t forget to take care of yourself. And keep me in your mind always! We don’t know what happened in next. If one day after waking up you come to know that I’m not beside you, I go to the heaven, please don’t get frustrated. I’m always with you. Don’t forget to take care! You are like my breath. Without breath no one can live, in such way, I’ll not exist without you! Stay always with me for the rest of my life. Take care! If you ask me that how much I love you, I’ll tell you that I love you like air. So count the air first for counting my love! Take care always! Dear sweetheart, Don’t get so busy that you forget to call me or text me. If doing such then you must ready for punishment! Ha ha ha. Don’t become afraid. I love you! Keep smile always and Take care! I wish you love yourself as I love you, I wish you’ll take care of you as I care for you! Enjoy your days! Even if I don’t talk to you, don’t think that I don’t remember you anymore. You are always on my mind. You are the only one whom I can’t forget even after death. Please take care of yourself. Because your happiness means to me a lot. You are a part of my life. Without you I’m incomplete! I know that I’m nothing to you but you are everything of mine. 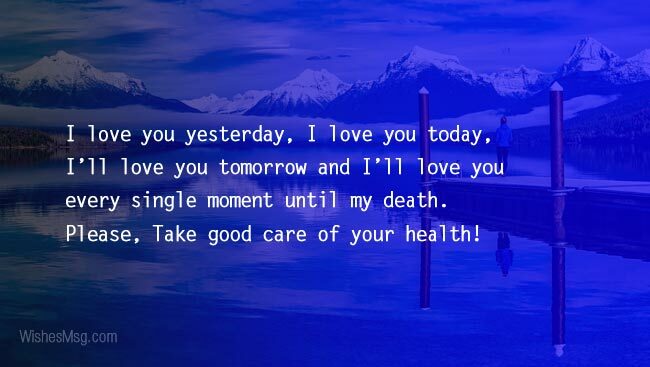 You have to take care of yourself because I love you! Actually, I’m waiting for your call, message. I don’t know how are you. I hope you are ok! Take care always! I love you yesterday, I love you today, I’ll love you tomorrow and I’ll love you every single moment until my death. Please, Take good care of your health! My Mr. Perfect! You are the best gift of mine from Allah. My loving husband I love you the most. Please take care of yours! I love my heart so much. Do you know why? Because you are inside of my heart! I love you so much, honey. Take care always! I wish to see you In every second, I wish to stay with you in every moment, I wish to take care of you till my death! Dear husband, You are special to me and forever will be! Take care! When there is everyone besides you I’ll there. When there is no one beside you I’ll there. I’ll there every moment of my life. Take care! So, it’s safe to assume that you can realize now how much important it is to take care of your special one! 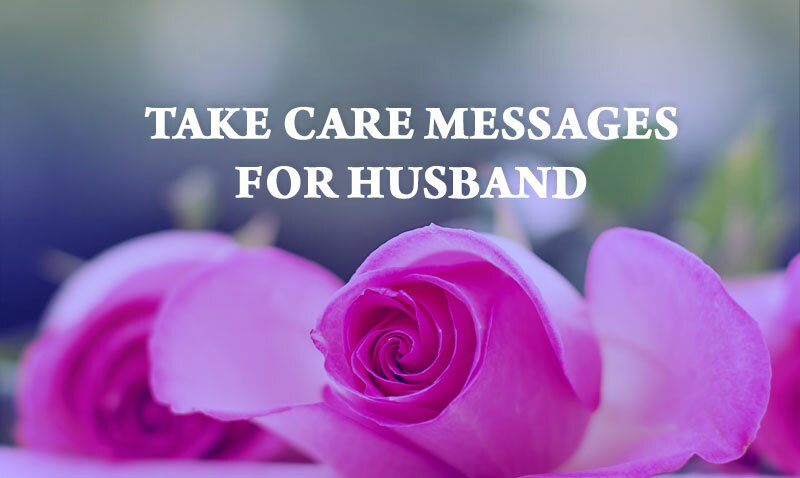 You may send these take care messages for husband and give him an amazing feeling of special love and care. Nowadays people use the social media to exchange good vibes, express feelings and thoughts with kith and kin, you may try your own! We promise it will help your guy reduces his stress magically!